Fossil Friday: Oldest fossils on earth! Welcome back to Fossil Friday. Today I’m linking to a 2013 article in LiveScience, that reports on 3.5 billion year old fossil bacteria. These Australian fossils are among the oldest fossils yet discovered. In life, they seem to have existed in shallow waters and may have been a variety of photosynthetic bacteria. Not only did life arise very early in the history of our planet, but oxygen producing organisms appear to have gotten their start very early, as well. The bacteria are visible as fossils because they form structures called stromatolites. 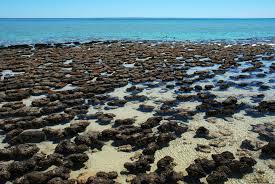 There are still bacterial stromatolites alive today in Australia. They were probably common in the early oceans, but rare now due to predators that would easily gobble them up! Previous article	← Does carbon production in stars reveal design in nature?